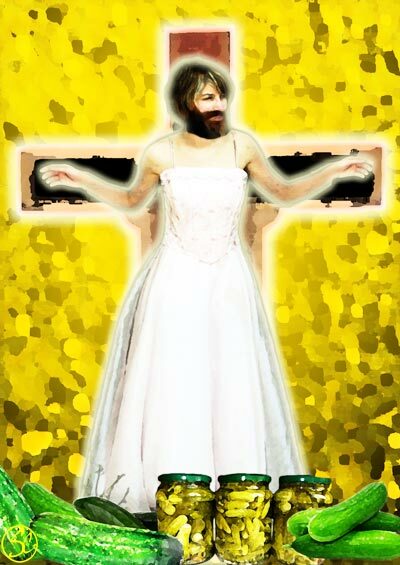 The Princess of Salade has been married to King Coney despite being granted a beard by God to uglify her and make the Pagan King think twice. To her horror, he liked it! Note, if you’ve not read Part 1, it’s here. fter the wedding came the feast, which took place in the Great Hall of the castle. The Princess sat at the High Table between her new husband the King and her father the Prince, and watched the eating and drinking, and listened to the speeches and entertainment, with a face that grew longer and longer, literally as well as metaphorically, for her beard continued to grow. Inevitably, as the feasting wore on and wine, beer and spirits were consumed in ever increasing quantities, the speeches and entertainment grew ever more raw. Innuendo was abandoned for increasingly specific encouragement and advice to the bridal pair for things to do during the coming night. The Princess, who had lived a relatively sheltered life up to now, found herself growing more and more flushed. She even found herself thanking God for the hair that covered so much of her face, for it concealed the worst of her blushes. After a while it struck her she could no longer tell the difference between the Pagan merrymakers and her father’s Christian courtiers. Even more remarkably, she was no longer sure which of the womenfolk were Christian and which Pagan, unless – of course! She realised suddenly that the Pagan women all wore false beards and had removed them to eat. Only she, among all the women in the company, was so richly endowed with natural facial hair. This discovery made the Princess even more despondent. Suddenly the Pagan King’s jester stood before her with a silver platter. On the platter was a single fat cucumber flanked by two large radishes. The cucumber was green, but otherwise strongly resembled her new husband’s thick, warty, pendulous nose, and the radishes were much like his tight little eyes. The jester turned around to show off his platter to the laughing, cheering company who, it seemed, could also see the similarity. Then he presented it to her again. The Princess reached out a hesitant hand and touched the cucumber. The King roared with laughter and the feasting men and women, Pagans and Christians alike, choked in delight. The Princess stroked her hand along the skin of the cucumber, feeling its knobbly, veined surface. The company cheered and shouted encouragement. Disturbingly, even the Prince, her father, was leering at the spectacle. The Princess lifted the vegetable gently from the plate. One of her delicate hands supported the green length of it underneath, while the fingers of her other hand encircled the top. Delicately she brought the cucumber to her lips. The crowd went wild with laughter and ribald cries. There was a deep collective gasp, a sound of the utmost horror, from male throats throughout the room. A few chairs fell over. In a nice counterpoint, a fraction of a second after came a chorus of high-pitched giggles from most of the female throats. Chewing, the cucumber juices running in her beard, the Princess turned to her husband to see how he was reacting. King Coney had not taken it well. A pallor had come over his features, those that were not hidden behind by all the hair on his face. His forehead and cheeks were clammy, his lips were white (which made his teeth appear all the more yellow) and even his purple nose had taken on a slightly greenish tinge. In fact, the Princess thought (absentmindedly taking another bite from the cucumber) if it got any greener that nose would look exactly like the cucumber. It seemed, without knowing, the Princess had hit upon the one action she could have taken that would cause the Pagan King the most distress. A beard on his bride, even one that really grew from her cheeks and chin, was something that pleased him, but the threat to his cucumber that the Princess had made, quite emasculated him – at least metaphorically. And temporarily. The Pagan King quickly got over his horror, and determined never to allow his new wife to make such a spectacle of him again. The Princess’s punishment was usual for the times: a cruel death. King Coney had her crucified as a terrible warning to all cucumber crunchers. After he recovered from the concussion he had sustained in the church, the Bishop of Salade, sent minions to fetch the body of the Princess to give it a Christian burial. There were some men among the Bishop’s flock who grumbled over this, but the Bishop was adamant. “It was the way she ate it,” grumbled the men. The Bishop was a very innocent and otherworldly soul and had lain unconscious throughout the wedding and feast. He could only judge the Princess, he insisted, by what he knew of her and by what people told him. As no one was able or willing to explain to the Bishop, in terms he could understand, exactly what was so terrible about the way the Princess had eaten the cucumber, a Christian burial was what she received. The Bishop commissioned a fine commemorative statue. It depicted the Princess dressed in her wedding gown, hanging from the cross. The beard with which God had manifested His mercy flowed luxuriantly from her cheeks and chin. The sculptor’s suggestion that she should hold a half-eaten cucumber in one hand the Bishop rejected as frivolous. Curious then that soon after the Princess’s tomb was complete and the statue unveiled, women supplicants would frequently leave offerings of cucumbers at the foot of the cross. Even in the depths of winter, when no fresh vegetables were to be had, jars of whole pickled gherkins would pile up at the Princess’s feet. Then came the stories of miracles wrought by the Princess. One overbearing husband had become suddenly mellow after his wife had prayed to the Princess. Another man had fallen beneath the wheels of a cart and had his arms crushed, the very arms he’d just used to thrash his wife and daughters to within a inch of their lives. A third, a drunken abusive bully, had stepped off the edge of a cliff and plunged to his death. In every case the Princess was credited with unencumbering the women of their menfolk. The cucumbers kept coming and the stories of the Princess’s efficacious interventions spread. No longer a Princess, but a Saint, a Saint who could uncumber women of cumbersome attachments. For centuries St Uncumber was revered and adored, but times change. Equality between the sexes having been finally achieved in 1969, the Catholic Christian Church removed St Uncumber from the list of “real” saints. Her story, like that of many another, is classified now as a fantasy, a myth. But somewhere perhaps, a saintly Princess Uncumber contemplates our world as she idly strokes her beard and crunches another cucumber. The young woman in the illustrations came from a competition on Freaking News from 2008. All the other elements came either from my own photos or from Creative Commons sources on the net.